We had a great time biking, the bikes and maps were wonderful! The biking was hilly! It was very hot, unusual for wales, and the hotel did not help us when we asked to open the windows more. They also wanted to give us two separate rooms because they did not have a twin room available. That took some sorting out! All in all it was very memorable and can't wait to go again! What a fantastic tour this is!! It includes a little bit of everything: scenery, history and fantastic bicycle adventures. And the accommodations were incredible. I can easily say that I've never stayed in a more historic yet comfortable hotel in my life. And that was especially important with this particular tour because it is all based out of the medieval market town of Ludlow, so your hotel is your home base for each day of cycling. If you decide to do this tour, prepare to enjoy the historically and gastronomically famous town of Ludlow and the surrounding area. The food is marvelous and the landscapes are spectacular!! Green fields that end at the ocean, sheep for miles, old churches, and some gorgeous and hilly bike riding. 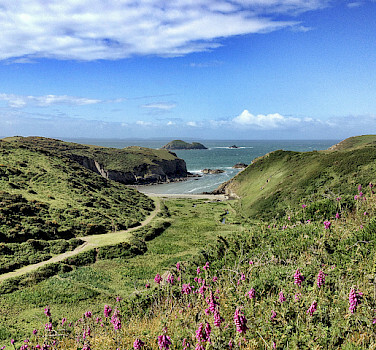 Wales is one of the prettiest, friendliest, (and hilliest ) places in the world. Our trip was perfect, thank you Carla and crew. We loved our accommodations in Fishguard. The B&B owners were so helpful and gracious. The routes were challenging and breathtaking. Doing a self-guided tour allowed us the become immersed in the local culture (especially when you need to ask for directions!). I give Tripsite a 10! Loads of fun and quite hilly. The castle at Stokesay and Ludlow were worth the price of admission alone. Locals are super friendly, climate mild during the summer. Some fairly treacherous roads to traverse, and moderately challenging mapping. Fantastically fun, though! Made for a great adventure for the second part of our honeymoon.